The action film Baby Driver is an edge-of-your-seat crime thriller about a getaway driver. Teenage motorist Baby (Ansel Elgort) is the most talented and skilled in the business, as long as he has music in his ears. Baby works for Doc (Kevin Spacey), driving different crews put together by the Atlanta crime boss for bank heists. These crews consist of top-of-the-line criminals such as Bats (Jamie Foxx), Buddy (Jon Hamm), and Griff (Jon Bernthal). The crews are different for every mission (except for Baby), and there always seems to be one member who is more paranoid than the others. Bats in particular doesn’t understand why Baby doesn’t talk and always has headphones plugged in. However, the others aren’t aware of Baby’s backstory and the accident he went through that altered his hearing. They ask if he’s a mute or just plain slow, but Baby suffers from tinnitus and needs the music to drown out the noise. He uses different iPods with playlists catered for specific moods, and moves along to the music while he maneuvers through traffic in breathtaking stunts. It’s clear while watching this movie that Baby is an unhappy kid, haunted by old memories from his childhood. Although he works for Doc, he isn’t really a criminal by choice. Growing up without proper guidance sent him down a bad road, resulting in a dangerous juvenile theft spree. After stealing Doc’s car he was forced to work for the crime boss or be killed. In the beginning of the movie, he’s on the cusp of paying off that debt and becoming free, after "one last job." That all changes after he meets his dream girl Debora (Lily James) and envisions a life outside of bank robberies. When a heist goes horribly wrong, Baby's criminal partners think he's responsible, and the police are now looking for him as well. Baby tries to flee so he can protect himself and his girlfriend, but it may be too late to change his ways now. 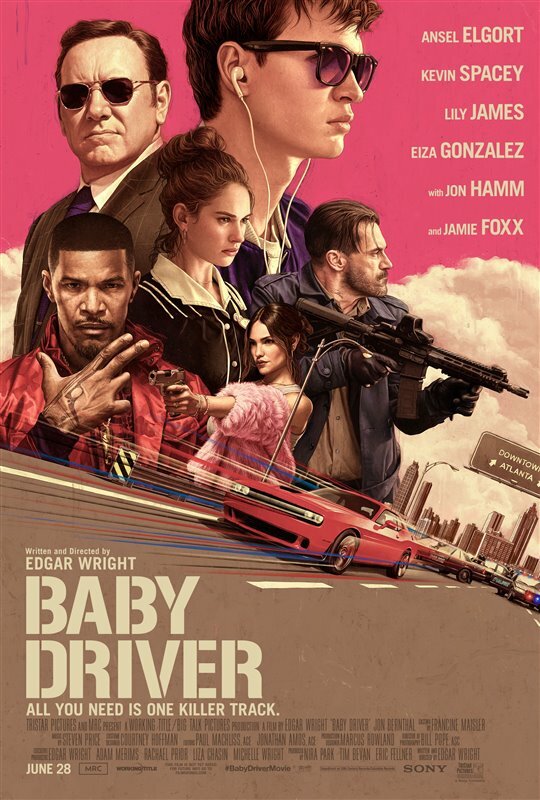 Director Edgar Wright has previously referred to Baby Driver as “a car film driven by music,” and to be completely honest, I couldn’t agree with him more. The soundtrack is full of nostalgic hits that carry viewers through the movie. When Baby moves, it’s to the beat of whatever is playing, and when the mood in a particular scene changes, the music sets the tone for what’s coming next. Have you seen Baby Driver? If you would like to rate it and/or write your own review, click here. When I saw the preview of this movie, I thought, meh. Not interested. But today I decided to go see it and was impressed after all. Would definitely recommend going to see this one.